Tired of not being able to find your accessories when you want them? 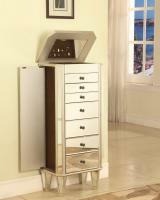 Organize your jewelry and accessories with a jewelry armoire. The Powell Contemporary Venetian Mirrored Jewelry Armoire is one of our favorites! We love the modern look and ample safe storage space for all of your bits and baubles. The top opens to reveal a mirror to help you adorn yourself! Finished in a bold silver and accented with mirror, this piece is both eye catching and fun. Visit www.cheapchicdecor.com for more details.